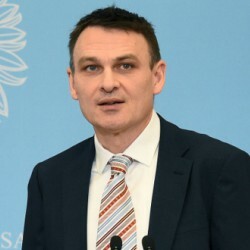 Wojciech Kaczmarczyk is Director of the Department for Civil Society at the Chancellery of the Prime Minister in Poland, previously Secretary of State and Government Plenipotentiary for Civil Society. In the Chancellery he is responsible for coordination of the National Program for the Support of Civil Society. As Chief Expert at the Foundation for the Development of the Education System between 2014 and 2016 he was responsible for coordinating the process of the selection of projects, formal and quality assessment, contracting and monitoring of assigned projects in the frame of developing Polish Higher Education Institutions as well as Erasmus+ Adult Education. He is an expert and researcher of the third sector in Poland. He was working together with the number of NGOs (i.e. Foundation in Support for Local Democracy, The Centre for Dispute and Conflict Resolution, Association for Forum of Non-governmental Organizations) coordinating projects, delivering expertise and researching institutional context of the civil society in the country. As an expert of the European Commission and the number of other institutions he used to evaluate educational and civil society projects within the frame of different programmes, incl. Erasmus+, Europe for Citizens, Leonardo da Vinci, Scholarship and Training Fund, Citizens for Democracy. Between 1999 and 2011 he was Vice-rector, lecturer and Erasmus university coordinator at the Institute of Public Administration in Kielce, responsible for programs, international co-operation and educational activities with the special emphasis on all issues concerning vocational training. Author of socio-economic essays in Twórczość monthly.